NEW YORK April 19 - Hugh Woolner, a passenger on the Titanic, is a rich Londoner [? ]6 years old, the eldest son of Thomas Woolner R.A. a noted sculptor. Woolner is a man of tremendous physical stength, stand [sic] 6ft 2½ inches and muscled like a Hercules. He took his blue at Cambridge in the Hammer throwing. At the pier Woolner was met by Edwarfd C. Desegrund, a friend, who had been awaiting him here. Desegrund had brought along a doctor and Woolner and the physician went to the Hotel Wolcott, where the doctor forbade Woolner to see anyone except Desegrund. Later the latter retailed the story Woolner had told of his experience. "Mr. Woolner was having a drink in the cafe with a friend named Steffenson [sic]" said Desegrund "when the shock came. It was so light that Woolner and his companion who were seated at a table were not thrown from their chairs. They got up and went out on the deck to see what had happened. They learned that the Titanic had struck an iceberg but neither among officers or passengers was there the slightest fear of a catastrophe. "For about half an hour, Woolner says he and steffenson walked up and down on the deck without the slightest realization that there was any real danger. They saw the boats being made ready for launching, but regarded this as merely a precautionary measure. "In about an hour they observed that the ship was beginning to settle at the bow. Then they knew that the Titanic was in peril and both men at once volunteered to aid in preserving order and in the work of getting the women and children into the boats. "They kept at the task until the last boat had been filled and dispatched. At one time, when a boat was being loaded forward, several men, evidently foreigners, jumped in ahead of women. An officer drew a revolver and fired two shots in the air to frighten the men and make them come out of the boat. They did not come out and Woolner and Steffenson jumped into the boat and dragged them out. Woolner says that so far as he knows these [were] the only shots fired on the Titanic. Saw Mr. and Mrs. Strauss. "Among the passengers standing on the deck during the loading of the boats Woolner particularly noticed Mr. and Mrs. Isidor Strauss. Repeatedly Mrs. Strauss was urged to get into one of the boats, but she steadfastly refused. "'I will not leave him,' she said, clinging to her husband, and they were still standing together when Woolner saw them. "There was," Woolner said, "no panic and the sea was quite calm. The last boat to be sent away was one of the collapsible pattern. Woolner and Steffenson aided in getting a number of women into it. As it left the side of the ship they decided they might as well try to save themselves, having done all they could for the others, and both men jumped from the deck for the boat. Steffenson landed on it but Woolner fell short. He struck the rail of the boat with his chest and plunged into the water, but was pulled into the boat. "According to Woolner the collision with the berg was about 10:45 and they got away in the boat about 2:15. Both he and Steffenson took oars and their boats rowed away after the others. They had gone about 200 yards when the Titanic sank. Her lights were all burning. 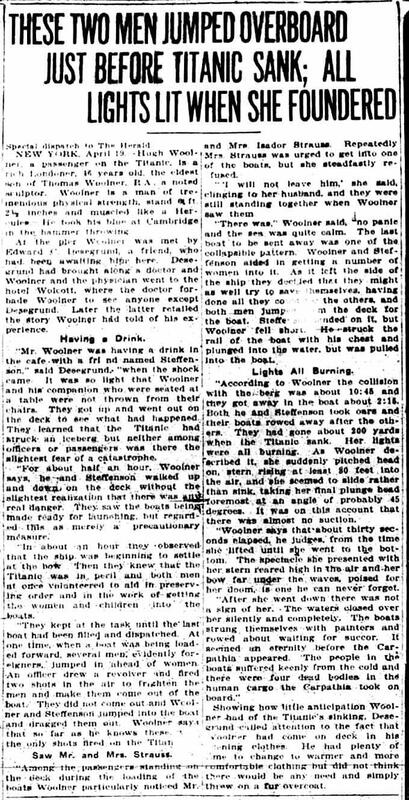 As Woolner described it, she suddenly pitched head on, stern rising at least 80 feet into the air, and she seemed to slide rather than sink, takin gher final plunge head foremost at an angle of probably 45 degrees. It was on this account that there was almost no suction. "Woolner says that about 30 seconds elapsed, he judges, from the time she lifted until she went to the bottom. The spectacle she presented with her stern reared high in the air and her bow far under the waves, poised for her doom, is one he can never forget. "After she went down there was not one sigh of her. The warters closed over her silently and completely. The boats strung themselves with painters and rowed about waiting for succor. It seemed an eternity before the Carpathia appeared. The people in the boats suffered keenly from the cold and there were four dead bodies in the human cargo the Carpathia took on board." Showing how little anticipation Woolner had of the Titanic's sinking. Desegrand called attention to the fact that Woolner had come on deck in his evening clothes. He had plenty of time to change to warmer and more comfortable clothing but did not think there would be and need and simply threw on a fur overcoat.